While kindly Saint Nicholas rewarded good children with sweets, his counterpart was typically depicted with a chain that he lashes about and a bundle of birch sticks meant to swat naughty children. This so-called “Christmas Devil”, the Krampus, was a horrific half-goat, half-demon beast whose horned, fanged, and fur-covered form must’ve been dreaded by children in the central and eastern Alps of Europe from which his story arose. Especially since, according to the folklore, the Krampus delighted in abducting the truly terrible children, stealing them away to his lair for untold tortures. One could suspect, given the number of irreverent Christmas themed art pieces that Kidrobot has issued on their rabbit-eared Dunny form over the years, that the company may have drawn the attention of Krampus. 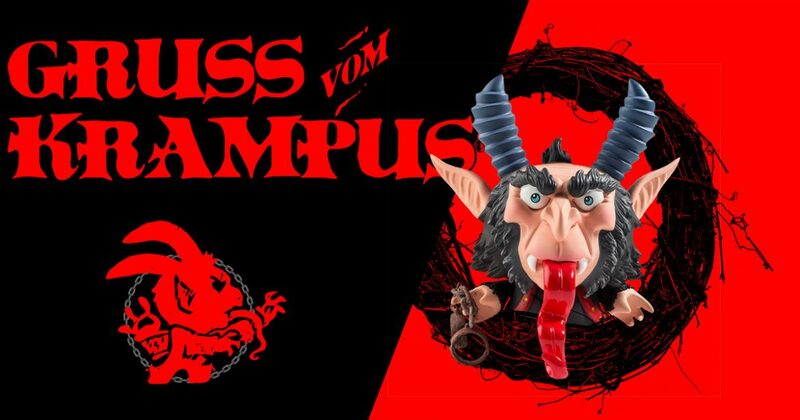 And perhaps they did, as the KRampus Dunny has come to Kidrobot, courtesy of collaborating artists Scott Tolleson and SeriouslySillyK (Kathleen Voigt). As can be said is true of any successful collaborative art piece, the KRampus Dunny‘s origin genuinely lies with the mutual respect shared by its creators. “Scott is a truly gifted and extremely versatile artist”, Voigt says of her collaborator, while Tolleson returns the compliment by sincerely stating that “Kathleen is an AMAZINGLY talented sculptor”. Of course, his praise doesn’t end there, as Tolleson emphasizes not only Voigt’s “attention to detail as a sculptor is top-notch” but also how she is “an incredible painter”, noting that her “finished pieces always stand out in a group of others”. Surely blushing from this volley of well-deserved accolades, Voigt gleefully asserts how “Scott’s full of creative energy”, how “he always has his mind and hands working on a multitude of artistic spectrums”, and how his art “can’t be pushed into one category or style”, all of which leads to her feeling “extremely fortunate to have the opportunity to collaborate with him on multiple projects”. In fact, with what is probably a smile, she states that “my hands can’t wait to turn his 2D drawings into 3D pieces”. Originally paired together by Broke Piggy to create a sculptural interpretation of Ozzbawt for 2015’s Lo-Tech Constructs series, Tolleson enlisted Voigt’s skills soon afterwards for his own Imperial Lotus Dragon Dunny Artist Proof edition. “The original Imperial Lotus Dragon design had the stamen as a part of the production”, notes Tolleson, clarifying that “it was cut [from the production version] by Kidrobot because of cost issues, which I totally understand”. Though, as it ends up, the “cut was sort of a blessing in disguise”, Tolleson continues, “because it allowed me to incorporate the stamens in the AP release, sort of an even further evolution for the Lotus Dragon“. Exceedingly pleased with the resulting work, Tolleson specifying that Voigt “nailed the look of the stamen” to the point that “it looks like it’s a part of the production”, the timing was right for the KRampus Dunny to rear its head. Both Tolleson and Voigt were separately invited to participate in October of 2016’s New York Comic Con DTA Dunny Show, which asked participating artists to create a unique piece of art on a 5-inch tall Dunny form, but they “were both short on time and called each other up to see if we could collaborate instead”, recalls Voigt. “At that time, I didn’t have an idea yet on what to do”, she continues, “so I asked Scott if he had any sketches available. He emailed me 7-8 different designs, among them a design for a KRampus Dunny, which I instantly fell in love with”. “I had designed a KRampus Dunny for my Odd Ones series”, Tolleson remembers, though “it didn’t fit well with the other designs” and thus wasn’t included. With Voigt entrusted to sculpt the incredibly detailed form, Tolleson notes that the “design absolutely evolved due to the collaborative nature”, elaborating that Voigt “added many little details here and there while respecting the original design”. Clarifying her adjustments to the design, Voigt remarks, “I just made his horns pointier and more prominent as well as gave him fingers instead of chubby Dunny hands and had creative freedom in creating the body of the boy [in the basket]”. And for the final touches, “Kathleen sent me the sculpt”, Tolleson adds, “and I painted it”, using “a lot of blending and dry brushing with multiple colors”. While neither artist recalls exactly how the one-of-a-kind piece came to the attention of Frank Kozik, Chief Creative Officer for Kidrobot, Tolleson does remember that it “came up in a phone conversation” he had with Kozik in which “we both agreed it would be a good [production] release around the holidays”. Though it should be noted that around which holiday wasn’t specified by Tolleson, as the KRampus Dunny arrived in its factory-produced form just in time for Halloween! A definite treat for art toy collectors, the factory-produced KRampus Dunny approximates the look of the unique original as closely as possible. “Naturally, the original custom will be the best quality piece”, admits Tolleson, noting that there “was a little struggle in getting the production pieces to match the custom but that’s normal”. Comprised completely of parts molded from Voigt’s original, with the addition of a newly sculpted bundle of birch sticks from her, this limited edition vinyl version was able to maintain the other accessories from the original: the chains and the roughly 3-inch tall naughty child in Dunny form. “I’m a fan of the removable Dunny boy in the basket”, Tolleson remarks, specifying that he feels “it brings visual interest to the back of the piece”, an area often overlooked in designer toys. “It’s a 3D piece of art and should be treated as such”, he affirms. With the more traditional black, brown, and red color scheme limited to 800 pieces worldwide, there is also an almost psychedelic rendition of the design. Exclusively available from Kidrobot directly, this variant version presents the same sculptural form in blue, yellow, and pink hues. Limited to 200 pieces worldwide in this variation, its strangely appealing decoration stands as a final testament of Tolleson and Voigt’s ability to work together, for, as Voigt comments, “we both collaborated on the color choices for the original and alternative colorway”.